Erdogan specifically decried the treatment of the German national team’s Mesut Ozil and Ilkay Gundogan, who were widely criticized for posing for a picture with Erdogan. Ozil quit the national team over the criticism. “They ostracized our Mesut Ozdil, our Ilkay, who were born and raised in Germany, just because we had a photo taken with them,” Erdogan said while speaking at the ribbon-cutting for a new mosque in Cologne. Thousands of police secured the area Saturday around the mosque after a demonstration outside the complex by supporters was barred by police for security reasons. Hundreds of anti-Erdogan demonstrators gathered at a separate area instead. The mosque the Turkish leader helped inaugurate belongs to the Turkish-Islamic Union for Religious Affairs, which has the largest network of mosques in Germany. The mosque visit followed a state banquet Friday that many German opposition politicians skipped. Dinner guests heard Erdogan reject criticism about the arrests of journalists, lawyers and union officials that followed a failed coup in Turkey. “It is not our job to protect terrorists,” he said. 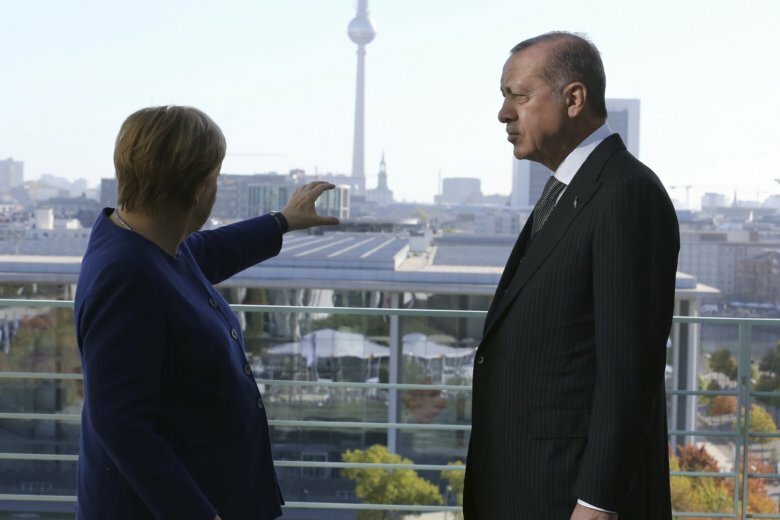 Erdogan was in Germany for a visit aimed at reducing tensions between the two NATO allies. He had breakfast with German Chancellor Angela Merkel in Berlin on Saturday.